Toronto bus terminal - Can-Ar Coach Service is a preferred choice for ground transportation with a large fleet of motor coach and buses in Toronto and Southern Ontario. We're a division of Tokmakjian Inc. specialized in group travel originating in Toronto, the gateway of Niagara Falls and the economic heartland of Canada. 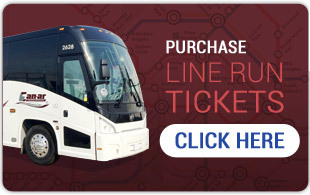 For over 40 years, our fleet of more than 180-passenger coaches is providing Toronto bus tours, casino Niagara bus schedule service, mobility transit and charter services, bus trips to Niagara falls and other forms of coach and bus transportation to millions of satisfied customers. Our facilities are strategically located to serve Toronto Pearson International Airport, Toronto, York Region, the rest of the Greater Toronto Area and Southern Ontario and Toronto bus station. What time of year are you planning the trip? Are the dates set or flexible? Can-ar is rebranding to TOK Coachlines. A new website is coming soon. Customers can continue to use the existing Can-ar website for all their needs while the new website is under construction.